a. The trusts or societies or companies or other organisational bodies that run educational institutions should release their audited income-expenditure statements in the public domain by posting those accounting statements in the websites of their educational institutions. Government should enact this as a law. b. Some of these corrupt institutions generate significant amount of money from governmental agencies and funding organizations like DST, UGC, AICTE, various ministries of state and central government etc. This should be stopped. Funding research projects, fellowships, conferences, workshops, centres of excellence, and other funding programmes for such capitation fee taking institutes should no longer happen. c. Multiple entrance exams has become a huge financial burden for students, while it has become a revenue model for profiteering, and another instance of flouting of prevailing admission norms. Let there be a professional body that can institute and coordinate a single common entrance exam for every professional areas like management, medicine, pharmacy or engineering. Let admissions be made from these scores through a single-window channel. d. Members of the trust and senior administrators of institutions that engage in such illegal practices should face legal consequences, including confiscation of their real-estate properties and financial assets. If a common man has to pay a fine for a minor traffic violation, why should the rules of the game be different for major legal violations? e. Founding fathers of Indian constitution gave exceptions to minority groups – on the basis of caste, religion, language etc. from the typical operating practices. Those who are a majority in one region of the country were a minority in another region of India. The founding fathers done this with a noble and benevolent intention. However, in many cases, such noble intentions as envisaged by the founding fathers of India are not respected by such minority institutions. They use this “minority status” as a loophole. f. Display boards in every educational institution that lists out phone numbers of anti-corruption agencies that people can contact. 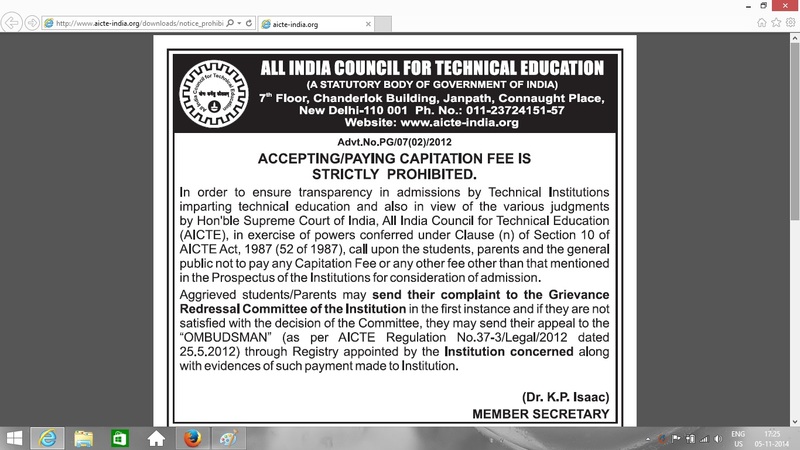 These boards should also mention prominently that giving and taking capitation fee is illegal. In many cases, such fees are collected by misleading the students, and in certain cases, such similar fee are collected, through subtle manipulation. I can inform my networks about institutions that offers cost-effective and values based education, and support such institutions and students in all possible ways. For this, i need to make a conscious effort to offer my time, energy, knowledge to students, faculty and administrators from such institutions. (Think about the possibility where the CEOs of the top 20 IT companies in India decides that they will not recruit any student from an institution that takes capitation fee, and they will recruit students from only those institutes that operate legally and ethically! In a couple of years, most students will not join engineering colleges that takes capitation fee. IT companies – this is also CSR!). I can also share my monetary resources with such institutions that are not connected to commercialization and is rooted in human values. a. Inform the management of the institution that this is an illegal practice. b. Tell your peers and colleagues about the illegality of such practices. c. Be corruption-free in one’s own daily practices. Lead a life untouched by corruption, irrespective of what is happening all around. Participate in active non-cooperation from practices and processes that are related to corruption. Naveen, then what would be your response towards the dedication and sacrifice of those who contributed to creating and sustaining this glorious land known as Bharat/ India? Did you read the blog about Emperor Harshavardhana? I am very glade to join this forum and lend possible support for fight against capitation fee I led the group of parents we together fought against a taking donations in english medium schoo in katapady and made them to give back the amouint to students .But after our childrens left the school now they again started to take donations . no parents are coming forward now to fight We cant interfere now because our childrens are not there. I have studied the karnataka education act. there is rules But i noticed that with the corrupt officeres of education dept schools are doing this corrupt practice if the rules are eplmented then this taking capitation fees will be stopped. corruption in education dept should be stopped and the accounatability to fixed to this officer. we have to be work on that aspect. And u can see most of the schools and colleges arefrom politicians . they make officials to bend the rules. My view is of that government should ban all the trusts. Every college which collects capitation fee has a trust in their name and collect it as a donation for the trust which is neither entitled to tax which indirectly reflects in reduced social spending by the govt nor directly goes to the needy. Now there are so much talk about the black money and one of the top black money generators are our educational institution. Everyone including politician and bureaucrats know this but why are they not against this. Because those institutions are one of their main sources of income. Our governance that was envisaged by constitution makers were perfect but corrupted by our politician. Basically we should see a transformation in the mindset of politicians and people should be aware of whom they are selecting to govern them. The people who charge commercialise education invest in irrelevant infrastructure (air-conditioned class rooms and conference halls and meeting rooms, and teaching methods and materials irrelevant to India). This soon becomes the norm, and genuine people finds it difficult to start a new institution due to the huge investment that is required. Exploitation of education in any from is highly condemnable. The practice of capitation further deteriorates the possibility of a value based education, which is the need of the hour. Institutes of learning, must come forward with innovative practices to make education affordable to all. All measures in this regard should be appreciated and supported. Those institutions, who get capitation fee are the ones gained a good name, holds a reputation among companies, shows 100% placement record or Pass percentage etc. Whereas, Government schools and institutions do not meet these standards and compete effectively with the private ones. No common man would voluntarily pay capitation fee when he/she gets it in a Govt. institution. So, Measures to improve govt institutions and a rule suggesting all the kids of government employees must study only in Govt. institutions help making education affordable to all. Government institutions should compete not with private ones, but with themselves, in improving their commitment to society. Otherwise, govt colleges will also start “show”. To compete with the “show” of 100%, govnmnt institutions will now “show” 101%. Instead of giving gift vouchers to gullible press-people to create reputation, institutions of learning can spend that money for causes that benefit the people living nearby – distributing fruit tree saplings amongst the people in nearby villages, organising ‘Annadaanam’ and giving the highest levels of sincerity in maintaining the sanctity of education. The suggestion that kids of government employees need to study in government institutions is a bold idea.